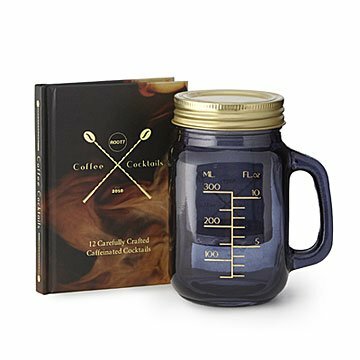 Make cold brew and turn it into a delectably boozy coffee cocktail, all in this mason jar mug. Proof that coffee is a 24/7 beverage, this fun set is designed to take you from day to evening on the Java Jetstream. Make your cold joe in the jar. Now it's time to experiment with the delicious-sounding recipes in the included book. Brewing Oaxaca (tequila, cold brew, chocolate mole bitters) and French-inspired Le Belair (white rum, espresso, pear) are madly mixological. Simpler classics include the chocolate martini, Irish coffee, or rum iced coffee. Who knows, maybe you'll surprise everyone by suddenly becoming a morning person. Made in China.